Since then, Ponleu has been back to the hospital twice, at both 5 months and 6 months old, because his limbs were not moving normally. Although Ponleu now looks like any other healthy baby, it is not known if the neonatal tetanus episode has caused any long-term health effects. Ponleu’s parents met two years ago when they went to find work in Phnom Penh. 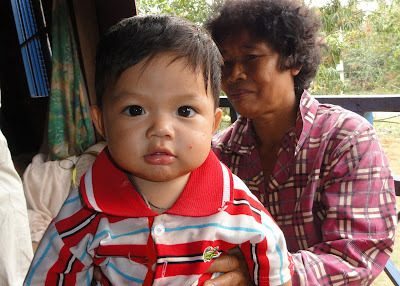 His mother, Sarin, who is originally from Svay Rieng province, was 18 years old at the time. They got married and shortly after Sarin became pregnant. Before she gave birth, she received two Tetanus Toxoid vaccinations: one in 2008 whilst working at a factory and the second as part of her antenatal care when she was pregnant. Sarin safely delivered their baby boy at a health centre in Kandal province. However, it was reported that an aunt put powder from a tablet on the umbilical cord of the new born baby soon after returning home from the health centre. This is thought to have caused the tetanus infection. Traditional practices like these, including unclean cord care in some selected areas, are one of the main challenges to achieving elimination of neonatal tetanus in Cambodia. The Ministry of Health, with support from UNICEF, has reached over 1.3 million women of child bearing age through immunization campaigns at both the village level and in the workplace, whilst at the same time strengthening routine immunization activities across the country. Promotion of antenatal care and delivery at health facilities has also been crucial in reducing maternal and neonatal tetanus. Alongside routine vaccination, antenatal care and clean delivery, UNICEF continues to support the Ministry of Health in its efforts to promote best practices in post partum care to ensure that babies like Ponleu are protected from what can be a fatal disease.